Studies since the mid-1980s suggest that university heads of schools experience the role as a series of tensions between enlightenment and enterprise-building agendas. It is apparent that the headship requires skills in management and capacities in leadership not necessarily furnished via typical academic pathways. In such light, the present investigation asks could the headship be different, given evidence that scholarly productivity and professional satisfaction are often compromised, even where heads value the role and demonstrate effective leadership? My aim is to contribute to the study of leadership and management in higher education; interpret discourses generated about the experience of the headship; analyse how the role is constituted and bounded; and explore how it might be transformed. 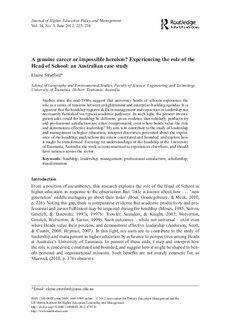 Focusing on understandings of the headship at the University of Tasmania, Australia, the work is contextualised to experiences elsewhere, and should have salience across the sector.